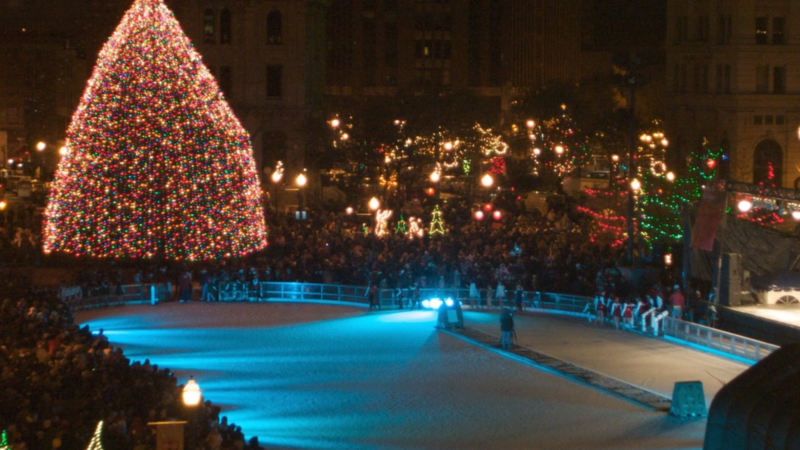 Get in the holiday spirit by ice skating next to the Christmas tree or giant Menorah in Clinton Square. Rent some skates or bring your own and test your skill on ice with your significant other. The prime Downtown location of the rink allows for many options for post-skating treats. Head over to Sugar & Co for some delicious desserts (they even have vegan and gluten-free options). Looking for something to grab on the go? Head across the street to the Ice Cream Stand for roasted s’mores ice cream or hot chocolate. It may not be the ideal weather to stroll through vineyards but it’s the perfect weather to cozy up next to a giant fireplace and drink wine. Anyela’s Vineyards offers a great atmosphere to enjoy great Finger Lakes blends and cozy up while sharing a cheese plate. Take advantage of being in this quaint town and explore the picturesque streets overlooking Skaneateles Lake. You can even catch a cast of over 50 characters from “A Christmas Carol” performing interactive street theater. This event known as Dickens Christmas starts the day after Thanksgiving and runs every Saturday and Sunday through December 23. The Tipperary Hill neighborhood is the perfect spot for a unique date experience. Snow doesn’t stop Syracusans, and it doesn’t stop our zoo animals either. Take a walk through the Rosamond Gifford Zoo and enjoy great indoor and outdoor exhibits. Watch snow leopards play in the snow or stay warm in the tropical bird room. After your zoo visit, check out one of the many Irish Pubs that reside in the Tipp Hill neighborhood. Get adventurous and choose from the huge craft beverage selection at Now & Later or grab a table and some pub food at Colemans. You can also head over to Blarney Stone for a signature burger and get competitive with some pool or darts. Have you found your potential chairlift partner for life? Find out at one of our many spots where you can ski, snowboard or tube to your heart’s desire. Ski power couples can hit black diamonds at Toggenburg and warm up after at the Foggy Goggles restaurant. New to the game boarders can take a lesson at Labrador Mountain then test out their skills together by taking on the beginner trails (stopping for wings and live music at the Last Run after, of course). Couples looking for a fun thrill that doesn’t require any skill can check out Four Seasons Golf & Ski Center and race to the bottom of their tubing hill. Pick a mountain and activity, get your adrenaline racing and share in a fun day together. Share in your love of sports together by catching one of our many great teams we like to call our own. Get on the kiss cam at a Syracuse Crunch game or share in the basketball season hype by catching a Syracuse Orange game. If you have the same taste in stadium snacks and sports teams then you’re pretty much meant to be, right? If you’re looking to celebrate a win then the fun doesn’t need to stop there. Whether you catch a game at the Carrier Dome or War Memorial Arena, there are plenty of nearby options for post-game dinner or drinks. Looking for a romantic holiday experience? Starting December 15 you can take a 20 minute sleigh ride through Highland Forest on a horse-drawn sleigh. Make it a double-date and go with a group or book a private experience. This is a great time to take in the scenery of one of the most beautiful snowy landscapes in the area. If you want to make a weekend out of holiday spirit then head over to Chuck Hafner’s Cut Your Own Christmas Tree Farm and bring home the perfect tree to decorate. Consider it a souvenir from a successful holiday date experience. If you’re looking to bring out your creative side this season then take on the Syracuse arts scene. Pick out your favorite ceramic pieces at the Everson Museum of Art or even join in on a class together. The Everson also offers a Festival of Trees where you can view beautifully decorated Christmas trees. Go out for a night of symphony music by catching a performance by Symphoria. There are even plenty of opportunities to see a show brought to you by Redhouse or Syracuse Stage. A theater is the perfect place to escape the elements and enjoy a night out!